At Modo we do things differently. As a small boutique building and design team, we always look to innovate and create very special spaces. We are conscious about the environment in which we build. We not only try to develop buildings that look great with a modern contemporary street appeal, that have living areas that are very functional, but importantly properties that our owners will be proud to own and in which their tenants will be comfortable and happy to live. At Modo we take the time to listen, we work with you from concept to completion and invite your personal input and ideas. You never know, they just might become our next great design. Our goal is to make your experience both enjoyable and rewarding without the stress and drama you often hear about. We can either work with your plans and specifications or we can start from scratch and create a totally new design specifically to suit your site and most importantly your budget… and yes, we’ll even build to lock-up stage only if that is what you want. When you engage the Modo team we will carefully assess your site for project suitability, review it’s dimensions, slope, site access, orientation, neighbouring buildings and we always try to come up with a design that is cost effective. Our team has a long and successful history in all facets of building, design, project management and investment building, as well as statutory regulations and town planning. Modo’s principal, Glenn Dornbusch, has three decades of experience in architectural design, residential and commercial building, building inspections and regulations. He holds registrations as an Unlimited Domestic Builder, Unlimited Commercial Builder and Unlimited Building Inspector. Glenn originally studied Architecture at RMIT, then studied Building Surveying and became an Unlimited Building Inspector. He has worked in construction supervision and management with some of the largest building companies in Melbourne, and previously founded and grew one of the largest timber building companies on the East Coast. He has close ties with the real estate industry and a strong knowledge of town planning. More recently Glenn established Modo Project Builders, a specialist design and construct project building company that works direct with developer and investor clients, either on a build-to-sell or build-to-hold basis. The growth of residential property investment, particularly by small investors, was catalyst for a new way of thinking. Generally, small investors are advised of the attractiveness of losing money every year by negative gearing rental properties in order to reduce their tax bill, in the expectation of capital growth over time. By working direct with their builder, investors effectively ‘buy’ a newly-constructed property at the optimal price, thus generating for themselves the margin that would normally be added by a developer. Whether selling or holding, this massively improves their investment returns. 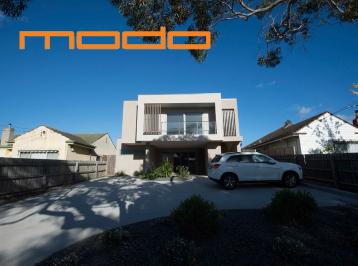 Modo employs its own design staff and as a design and construct project builder are well-equipped to co-ordinate most developments. Glenn is very much focused on doing the right thing by his clients. He is honest and up front and above all enjoys helping Modo clients to achieve their desired result. Neil joined the Modo team a few years ago as General Manager and shareholder bringing with him a wealth of building industry experience. He has over 30 years experience in the residential building industry, and holds registration as an Unlimited Domestic Builder. For many years he was a director and shareholder of various small-mid size building companies including a high end boutique style designer builder. After moving forward from these ventures he transitioned into senior management roles in several of Victoria’s largest corporate building companies covering the vast range of building disciplines from high end architectural designer homes to national scale volume building companies, including State Manager – Contract Housing for one of Australia most iconic brands. Shaun joined Modo as its principle product designer approximately six years ago, he holds an Advance Diploma Building Design (Architecture) and now heads up our design team. His early trade years were spent working as a qualified bricklayer. He brings youth, speed and creative efficiency to his work, and loves nothing more than drawing some pretty impressive designs that excite Modo clients. Shaun has a passion for good design and structural detail and pays particular attention to the seemingly small design features that often have a large impact on the finished appearance of a project. Having forged a strong working relationship with Building Surveyors, Town Planners, Structural and Geotechnical Engineers and other professional service providers has set Shaun well ahead of many of his industry piers. Jane holds an Associate Diploma of Architectural Building Design, she recently joining the Modo team in the key estimating role but splits her time assisting new product design development and drafting. Interestingly, Jane brings to the table a passion for design having amongst her various qualifications a Degree in Fashion Design (RMIT). Over recent years she has worked as a freelance interior design consultant for both new home builders and renovation companies, and has project managed several small and mid scale housing projects. Simon brings a wealth of experience to the project management and supervision role having worked for many years as a fully qualified and indentured carpenter. Simon was not content with gaining this valuable hands on experience, he also studied and completed his Diploma of Building Construction, and more recently added to these qualifications completing a Diploma of Building Surveying which now sees him as one of the most skilled members of the Modo team.